Simpson Racing HS.YTH.11 Hybrid Sport Head & Neck Restraint - SFI Rated Size: Youth Simpson's Hybrid Pro Sport, SFI 38.1 Approved head & neck restraint system and it is manufactured of high quality composite and carbon fiber in the USA. It was developed through extensive testing the patent pending Side Stabilizing Gusset. The compact design (7") minimizes the size giving you the first device not requiring seat modification. 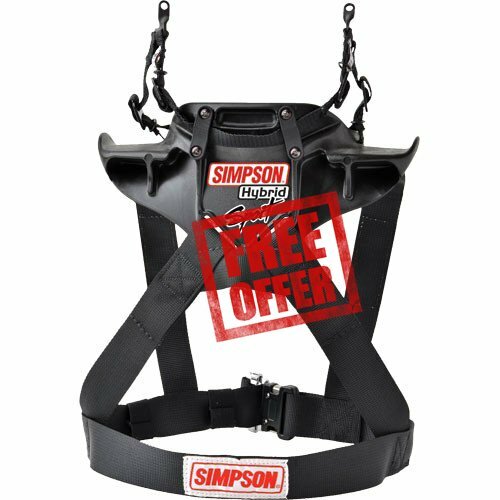 The Simpson Hybrid Sport offers the same features as the Simpson Hybrid Pro Slide in a value priced composite version.Simpson Hybrid Head and Neck Restraints are the only choice for racing protection. Hybrid Head & Neck Restraints offer the lowest profile , designed for easily exiting the car without the danger of getting hung up on other gear. Plus, they provide you with maximum comfort and maneuverability. Expertly engineered by Trevor Ashline with Safety Solutions technology, Simpson Head and Neck Restraints give you every advantage on the track. Specs: HYBRID SPORT CERTIFICATIONS: SFI 38.1 High quality composite and carbon fiber construction Minimalistic design. Compact size under 7" Sleek, modern profile with defined wings for seatbelt containment Anchor Type:Quick-release In-Seat Model:No Hardware Included:Yes Molded Pad Included:Yes Sizing XSmall - Chest 32-36" Small - Chest 36-40" Medium - Chest 40-44" Large - Chest 44-48" X Large - Chest 48-52"